Rose flavour cupcakes with rose water icing and fondant ... you guessed it, roses! I thought I would have a little play with some fondant, and some flavourings last night. Just a really quick little experiment this time! 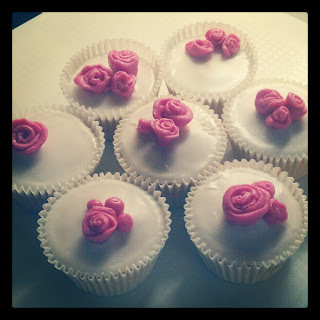 I wanted to play with some simple fondant flowers. 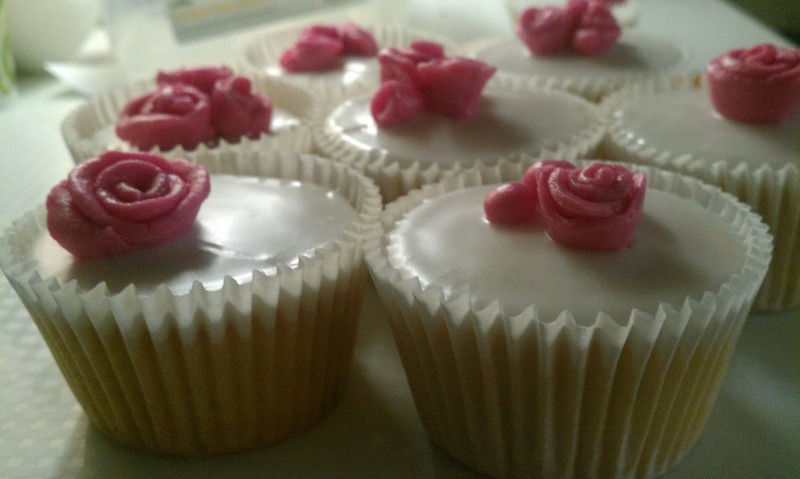 I made a normal batch of cupcakes using rose water to flavour them instead of vanilla. I topped these with a simple icing of icing sugar and rose water, I made this nice and thick so it wouldn't run too much and spread it evenly to the edges of the cupcake cases. The little rose decorations were simple ones made up of fondant cut into ribbon shapes and then rolled up, with the top edges flattened and flared out slightly to make a more realistic shape. As I used fondant which I had made previously, these cakes didn't take very long to make, so they were a nice little mid-week evening bake, which kept me happy.